A three-day training course was held at UNAVCO for members of three science groups who will be using precision GPS equipment in the upcoming Antarctic field season. 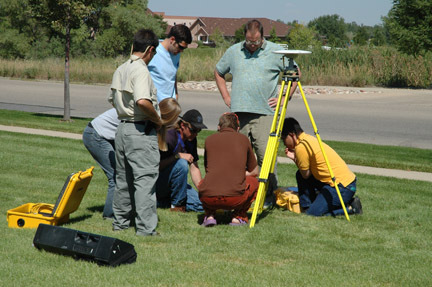 This course covered the basics of GPS technology, Trimble 5700/R7 receiver systems, survey techniques, and data processing and quality checking using Trimble Geomatics Office software. The focus of the course was to provide each science group the necessary hands-on training for successful deployment of precision GPS systems at deep field sites in the Antarctic, and the content was tailored to address the individual measurement requirements of each group. Similar classes can be provided elsewhere by UNAVCO upon request. Request Support if interested.